Do you ever wish you could get advice from Martha Sears? Well, now you can! She is an RN, co-author of over 25 books, and mother of eight children. 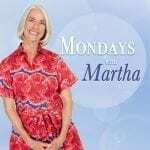 Get her expertise on parenting, nutrition, breastfeeding, and much more, here on Mondays with Martha! Find the answers to your questions every other Monday on this page! If you would like to submit a question to us, follow us on Instagram (@askdrsears) and send us a direct message!